In the town centre of Caboolture CBD is the exciting and innovative cultural centre dubbed the Caboolture Hub, comprising of a modern state-of-the-art library, art gallery and learning centre. This $25 million dollar project undertaken by the Moreton Bay Regional Council was declared officially open to the community in December 2011 and has proven to be a significant step towards improving community facilities which, according to the council, "promote life long learning and play an important role in the cultural fabric of this region". The Quest Newspapers declared the Caboolture Hub "the biggest community facility to be built in Caboolture in decades" and I have to agree that the Hub certainly stands out as a prime facility in the middle of town. You can expect to find plenty of exciting features at this newly developed cultural centre. My first stop inside the Hub was to the Caboolture Library. Compared to some of the libraries I've previously visited in the larger town of Brisbane, this one certainly stood out for its size and multiple features. The Caboolture Library also offers the community a heap of free events and workshops for all age groups from babies through to seniors. Open 6 days a week, click here for opening hours and event details. The Caboolture Regional Art Gallery is another exciting feature of the Hub. Four galleries dedicated to showcasing exhibitions of state and national art work including painting, video, film, photography and 3D pieces. For future details of exhibitions click here. There are plenty of free activities for children and adults such as collage making for kids, daily guided tours and floor talks for adults regarding the history behind the art work and individual artists. You can view the Gallery collections online here. Open 6 days a week, click here for opening hours and contact details. In the Learning and Business Centre and Creative Studios section of the Hub there are a number of professional business rooms and studios available for hire, including a recording studio for those who nurse a passion for performing through song. 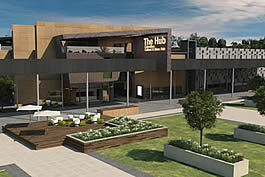 Keep a lookout for the Caboolture Hub café and retail outlet that's scheduled to be completed soon.